One of the big advantages of flying direct from Manchester is that I don’t have to make the short hop down to Heathrow first, so I can leave at a civilised hour. In this case, the flight left at 13:25, which meant that I could leave my Dad’s house at the relatively relaxed time of 10:00 and, for once, was able to get a half-decent night’s sleep before my flight. I got to the airport at 11:05, the taxi ride from my Dad’s having taken pretty much exactly an hour (I was slightly late setting off). As usual, I flew from Terminal 3 and, on the way in, drove past my plane, which was already on the stand at the end of the terminal. The American Airline desks are next to the British Airways ones and, despite having checked in on-line, I still had to go to one of the automated check-in booths to get my luggage tag printed out. I then had to take my bags and boarding pass to bag drop (ie a manned check-in desk) and, from there, haul it over to over-sized baggage (that last part is my own fault for having a rucksack). Even so, it does seem a bit involved. However, despite my complaints at the long-winded nature of the process, there were no queues and everything went very smoothly. Within 15 minutes I was checked-in, my bag was dropped and I was on my way to security. I was flying business class (work was paying) so I got to use the Fast Track security lane: within 10 minutes, I was out the other side. Of this 10 minutes, most of it was spent taking everything out of my bag before going through security and then putting everything back in again on the other side (not to mention putting my boots and belt back on and putting everything back in my pockets). I’ve now got this down to a reasonably fine art, particularly at modern airport security like Manchester, where you line up in a series of rows to fill your trays, so one person (ie me) isn’t holding up the entire line. First, I take everything off that needs to come off and empty my pockets, putting all these things (except my boots) in my bag. Next I take everything out of my bag that needs to go through security separately. Usually this is just my two laptops (yes, I travel with a spare) since these days I carry my coffee-making kit in a separate tote bag (it saves time). Then I put my bag on the first tray (this is important), my laptops on the second tray, coffee kit and camera on a third and my boots and coat on the fourth and final tray. By 11:35 I was in the lounge with an hour to kill before my flight. You can see what I got up to after the gallery. The only other time I’ve had access to the lounge at Manchester was when I flew to Tokyo the previous month. On that flight I was running late (a common experience, but not entirely my fault on that occasion) and had less than 10 minutes in the lounge. This time I had an hour before my flight was due to board, so I made the most of it. The lounges in Terminal 3 are upstairs, with the British Airways lounge occupying one half of a circular space above one of the main bars in the terminal below. Having spent an hour there, I can safely say it’s one of the nicest lounges I’ve been to, very quiet and relaxing. There’s all the usual lounge features, including free Wifi, food and drink as well as plenty of power outlets (which isn’t always the case). There’s a quiet lounge seating area off to the right as you enter, while if you go left, there’s a computer/business area off to one side, followed by the food, then coffee and finally a bar. There are a few tables here, plus a curved, glass bar which overlooks the terminal below. However, if you keep going, there’s more seating, mostly clusters of sofas and armchairs, with a few tables thrown in for good measure. This is at the far end of the lounge, so you don’t get people wandering through, plus it pretty spacious. There are views on the far side across to the runway and (when it’s not raining and you can see them) to the hills beyond. It was raining, by the way. Having missed out on the coffee on my previous visit, I was determined to give it a try this time, particularly after my visit to Union, where it was confirmed that Union’s coffee had been rolled out to all British Airways’ UK lounges. There are two coffee machines at Manchester, and, in the interests of balance, I tried them both, starting with the one on the left. I’d also brought my scales along with me, so I weighed the shots. And timed them. Yes, I know. I’m strange. In both case, I had an espresso. The first one I timed at 14 seconds, which is from when the first coffee appears in the cup, so it doesn’t include pre-infusion. The other way of doing it would be to time it from when I press the button on the machine, but that would include the grinding time. This gave a dose of 45 grams and was, I have to say, pretty good, on a par with the first Union coffee I had at Heathrow on my way out to Tokyo, if not a little better. Like that one, it was rich, full-bodied coffee and, unlike the one I had at Heathrow, I didn’t get too much bitterness. I returned to the second machine, which I timed at 12 seconds, producing a 43 gram shot. Had I had more time, I might have done a couple more shots on each machine to check for consistency. As it was, this second espresso wasn’t as good as the first. It was a little under-extracted and while drinkable, it really suffered in comparison. By then it was almost time to board the flight, so I packed up my stuff and headed down to the gate. You can see how I got on after the gallery. My flight was due to board at 12:35 and past experience has shown that flights rarely board on time, so when boarding was actually called at 12:35, I wasn’t too bothered. I slowly packed up my things and wandered down to the gate, which, unlike the “gate” for my flights down to London (which is basically a corridor to queue in) is actually a proper gate, with seats and everything (although not too much of everything). Fitting, I last used these gates for my previous flight to Chicago with American Airlines, the last of my three trips last year. Sad to say, nothing much has changed and there still aren’t enough seats for a full plane load, which made me doubly glad that I was able to use the lounge this time around. As I was wandering nonchalantly down to the gate, a final boarding call was made, at 12:50, and I arrived at the gate seconds later to find that there was no-one there (other than the staff running the check-in, thankfully). It turned out that the flight was almost empty (which might explain why American Airlines are dropping the route in a few weeks from now) and it had boarded in double-quick time. Unlike last year, when I was pretty much the first person on the plane, here I am fairly sure that I was the last one to board. On the other hand, it meant there were no queues and I could stroll straight on. My flight, by the way, for those who are interested in such things, was American Airlines AA055, and it departed from Gate 55. As I noted this time last year, things like this please me no end, particularly since I drove along the A55 to get to the airport. I shall miss this flight when it’s gone. The flight was scheduled to leave at 13:25, arriving at Chicago O’Hare’s Terminal 5 at 15:40 local time (23:40 UK time) making a total of 8¼ hours flying time, relatively short compared to the 12+ hour flights I’ve been doing in recent months to Bangkok and Tokyo. When I flew last year, the plane was a relatively old Boeing 757, but this year, American Airlines had upgraded the flight to a new and very handsome-looking 787-800, which I was looking forward to almost as much as flying upfront in business class (last year I was in the back, although I was in the premium seats by the bulkhead). You can see what I made of the new plane and business class after the gallery. Although we were fully boarded by 13:00, we didn’t close the doors until 13:15, giving me plenty of time to potter around and settle into my (very nice) seat, 1A, which is right at the front of the plane, on the left-hand side. I tend to spend a lot of time describing the cabin layouts, where the seat is, etc, but it struck me that it might be easier if I gave you a picture as well, so here’s Seat Guru’s map for this plane. American Airlines’ 787-800s have no first class, with the relatively small business class section occupying the space where first class would normally be. There five rows of seats at the front, between the first galley (which is right behind the flight deck) and the second, larger galley (where we boarded the plane). Another two rows of business class are tacked on after the second galley, and then it’s economy seating all the way to the back. All-in-all, the 787-800 is a relatively small plane in the grand scheme of things. I’ve become used to the British Airways Club World seating, with its pairs of seats, one facing forwards, the other backwards, with eight seats in each row across the cabin (although it’s only seven in the slightly narrower 787s, where the middle set of four reduced to three, the outside seats facing forwards and the middle one facing backwards). Here, however, the seats are at an angle, similar to the business class seating when I flew with Vietnam Airlines and China Eastern. Like those airlines, there are four seats in a row, one by each window, facing one way, and, separated by an aisle on each side, two in the centre, which face the other way. Each seat is angled at roughly 30⁰, so compared to the British Airways layout, where the seats are straight, more rows can be fitted in, but at the price of only having four seats to each row. Although it felt to me that this layout had more dead space, the trade-off is about equal: Seat Guru shows that British Airways gets three rows with 21 seats in the equivalent space to American’s five rows and 20 seats. However, unlike Vietnam Airlines and China Eastern, where all the seats faced forwards, here they alternate with seats in one row facing forwards and seats in the next facing backwards. They also alternate across the row, so when the two window seats face forwards, the two centre seats face backwards. My seat, 1A, was at the front and faced forwards, so the back of my seat by the aisle, and the front, where my feet were, was pointing at 30⁰ towards the bulkhead. This left a gap to my left, occupied by the back of the seat behind me. I had two windows, although the one to my left was obscured by the shell of my seat, leaving a window ahead of me to the left. This wasn’t so bad, since in my natural seating position, I was looking directly at it. My only issue was that it was quite a long way in front of me, so I constantly found myself leaning forward to get a better view. In contrast, the seat behind has the window in a more traditional position, next to the seat, although you would have to turn your head by about 120⁰ to look out. I think, of the two, I had the better of it. By now I was settled in and it was time to take off. You can see how that went after the gallery. We pushed back at 13:20, which was five minutes early, although we still managed to play the taxiing game, which was, given how small the airport is, quite an achievement, even more so when you consider that we were taking off to the east and the terminal is at the western end of the airport, so we didn’t even have far to go. What I hadn’t realised, though, is that Manchester has two runways, and we were taking off on the second runway, which starts near the western end of the first, hence the long taxi. As a result, we didn’t take off until 13:35, which at least gave us time to watch the safety video. After that, I switched over to the in-flight map, which, before we took off, was showing a projection of our route, including a fly through video which I’d not seen before. One slightly unusual feature of the forward-facing business class seats is that have a shoulder strap as well as a lap belt, something I’ve never come across before. This only has to be fastened for take-off and landing, but it did make leaning forward to look out of the window a bit more uncomfortable. I was on the left-hand side of the plane, which is definitely the wrong side if you want views of the airport and the other planes. Unless, of course, the wind is coming from the other direction and you take off to the east, but in the handful of times flying in/out of Manchester, the wind has always been from the west. On the other hand, it was the perfect side for me for views as we climbed after take-off, heading out over the Wirral and then along the North Wales coast. Unfortunately it was very cloudy, so I didn’t get the views I’d been hoping for: on a clear day, I could probably have seen my home town of Holywell and, in theory, I should have got good views of Snowdon too. The seat belt signs came off after 15 minutes, at which point the cabin service started with drinks and warm nuts at 13:55. Rather annoyingly, the windows were also slightly dimmed, giving what views I did have a blue tint… By 14:00 we were heading out across the Irish Sea and, I realised, would soon be landing if we’d been going to Dublin! As it was, we crossed Irish coast and headed out over the Atlantic at 14:10, with lunch arriving five minutes later. I don’t know if it’s because I had a special meal ordered, but my starter and dessert arrived together on a single tray, with a salad, some prawns and a rather unappetising chocolate pudding. My main course, gnocchi with a tomato sauce followed that and then I abandoned the chocolate pudding and asked if I could have an ice cream sundae, which I’d heard good things about and which was easily the best part of the meal. By 14:50, lunch had been cleared away, which was just as well since we then ran into some turbulence and the cabin service was suspended for half an hour. At this point, I decided that a post-lunch nap was in order, which gave me a chance to play with my seat a little bit. I wrote earlier about the cabin layout, but not the actual seat. This has all the usual features (at-seat power, pop-out TV, large, fold-out table and a bewildering array of seat controls). There’s nothing remarkable about either the TV or the table; take a look at the photos in the gallery if you want to know more. The main thing to note about the TV is that it’s quite a long way forward from the seat, folding out from the casing just in front of the footrest. The table, meanwhile, lifts up and folds out from the console on the opposite side. One area where these seats really do well (compared to the standard British Airways Club World seats) is the at-seat power. There are two USB ports and two multi-plug power outlets, all set high up on the front of the seat-shell, a big improvement over British Airways where the main power outlet is on the floor. Up here, they’re easier to access and you don’t have wires trailing around on the floor. Another area is storage. Since the seat’s at an angle, there’s a triangular section to one side (mine was on the left), extending forward of the seat, where it houses the fold-out table. This provides excellent storage which is sadly lacking in the British Airways seats which have no flat spaces to put anything. Even better, the rear-facing seats have a second flat area on the other side (the forward-facing seats have an arm rest in that space). This is similar to the Vietnam Airlines and China Eastern business class and I really miss this storage space (for things like my glasses and phone when I’m sleeping) when flying in Club World with British Airways. At first, I struggled with the seat controls, which I always find bewildering (and annoyingly different on each airlines). Here the seat controls were behind seat when it was upright, so that they were hard to get to. On the plus side, there were only two buttons, one for raising the seat/moving it back and the other for lowering the seat/moving it forward. I used this to turn the seating into a lie-flat bed for my nap, but I wasn’t very impressed. It was rather uncomfortable and I couldn’t get it completely flat. What’s more, because the seat shell narrows to a point at the footrest end, I really struggled to get my feet to fit (which sounds absurd, but it was a problem). I either had to lie so that the seat’s head rest was on shoulders or lie on my back with my knees bent, neither of which was very comfortable. In the end I found that if I laid on my side, with my knees bent, it wasn’t too bad, which is how I spent my hour’s nap. I was only after this that I discovered (by accident) that as well as the two buttons, there is a much more useful and accessible smartphone-sized table embedded in the console just in front of the remote control for the TV. This had plenty of controls, including a lie-flat section which did actually make the whole bed flat and, it turned out, much more comfortable, although I still found it best if I lay on my side. There were other settings, including a recliner style, which looked uncomfortable, but when I tried it, turned out to be pretty good: the back is raised at an angle, then the lower/middle part comes up under your knees, giving them support. Probably not very good for the circulation though. As well as these more advanced settings, there were some basic controls, including forward/back, which, for once, just seemed to move the seat forwards and backwards without changing its position, which is excellent. Since the seat has to fit another seat in beside it at an angle, the shell narrows at the back, so when the seat was set fully back, I found it narrow and uncomfortable, so being able to move the seat forward was a real bonus. Of course, once I’d got the seat as far forward as I’d liked (which meant I didn’t need to lean so far forward to see out of the window), I found that the table was too close to comfortably type on, even when I slide it as far back as possible. Oh well, you can’t have everything! Finally, there’s a custom screen, where you can control not only the forward/back elements, but each of the four individual seat sections (headrest, back, seat, footrest) which was awesome. Once you’ve got the seat set up as you like it, the controller then remembers the position for you! In all, I spent about 25 minutes playing with the seat controls, which might be more of a reflection on me than on its complexity: I was like a kid with a new toy! Overall, I preferred this seat/cabin layout to the British Airways Club World seats. There’s a lot more space and you don’t have to climb over anyone to get in or out of any of the seats. The only area where I think British Airways has a big advantage is in its window seats, where you really do get a sense of being in your own little world. Other than that, give me this layout any day! You can see how I got on during the rest of the flight after the gallery. I napped until 16:10, at which point we were still flying a much more southerly route than expected. If we carried on with this course, we were going to end up in Florida, not Chicago! The seat belt signs were still on but it wasn’t, and hadn’t been, very bumpy, so I went to the toilet, something the crew seemed remarkably relaxed about. By now the windows were dimmed (although not completely blacked out) and the main cabin lights were down. This always annoys me, since it was bright daylight outside and, regardless of which time zone you were in (UK or US), everyone’s body clock still thought it was daytime, so quite why they have to try to turn it into night is beyond me. When the seat belt signs finally came off at 16:25, I got some American Airlines coffee which was, frankly, rather poor. At 16:45, we finally turned to a more westerly course and started flying towards Chicago. At 17:50, after an hour working on my laptop, we crossed the Canadian coast at St John’s, Canada’s most easterly point. I did some more work and then the crew served a light meal at 20:00, which was cleared away by 20:20. At this point the cabin lights came up and the windows were cleared, just as we clipped the southern end of Georgian Bay, heading for the southern tip of Lake Huron. The cabin crew started making preparations for landing at 20:30, when we were crossing over the state of Michigan, still over an hour out of O’Hare. The pilot said that there were storms in the Chicago area and I guess that they wanted to get things out of the way beforehand. Part of the preparation included collecting the headphones, which would be inconvenient if you were watching a movie at the time! On the whole I was fairly annoyed: the seat belt signs had been on and off (mostly on) during the flight and we’d not had much turbulence beyond what we’d hit at the start of the flight. It all seemed like overkill at the time. I took the opportunity to make some coffee, my last chance before we landed. Having been unimpressed with the airline coffee, I gathered together my kit: Travel Press, Aergrind and Therma Cup, plus some beans from Taylors of Harrogate, the new Deep Purple blend, which I’d been enjoying through my cafetiere at home. I headed off to the galley to get some hot water and, since it was looking rather busy in there, I disappeared into the toilets to grind my beans and make the actual coffee. Even though I say so myself, it was pretty decent and far superior to what I’d had earlier on in the flight. By this time (21:00) we were heading towards the eastern shore of Lake Michigan and the crew started to make the final preparations for landing, so I had to put my laptop away, even though we were still expecting to land at 21:40 (or 15:40, local time). Cue me being even grumpier. However, in fairness to the captain and crew, it was pretty turbulent as we came in over Lake Michigan, so I could see why they wanted to get things done early, with the crew sat down and strapped in. With hindsight, I was being harsh on them. You can see how the actual landing went after the gallery. After the relatively bumpy approach over Lake Michigan, we were rewarded with some excellent views of downtown Chicago as we flew just north of the Loop on our way into O’Hare. We landed just ahead of schedule at 21:30 (local time, 15:30) and, after taxing for 15 minutes (O’Hare is a BIG airport), we arrived at our gate in Terminal 5 at 21:45 (15:45 local time). In the past, I would have stopped the Travel Spot here, but more recently, I’ve taken to describing my onward journey since the airport is rarely my final destination, plus there’s always the sometimes frustrating process of getting out of the airport itself. This has been particularly true of O’Hare, where, on past visits, I’ve spent over an hour in the queue for passport control. On this occasion, I reached the back of the queue at 15:55, just ten minutes after we got to the gate. Although the queue was pretty long, I’ve been in longer queues at O’Hare, plus the queue got much, much longer after I joined. One thing I will say in favour of the system at O’Hare is that it doesn’t separate out US from non-US citizens: they get to wait in the same queue as everyone else. These days, pretty much all US airports employ an automated kiosk system which acts as a sort of triage system (it also means that you don’t have to fill in the white Customs declaration form that they still insist on giving you on the plane since you enter this information into the kiosk), issuing you with a paper landing card. The only problem with the kiosks is that, regardless of the outcome, you still have to queue to see a human agent. This turned out to be another bottle neck, so there was another queue, which started inside the kiosk area, only adding to the confusion. This queue was then split into two, depending on whether you got a cross on your landing card. I got a cross, although I’ve no idea what this means since, on the rare occasions I don’t get a cross, I still have to see an agent, I just go to a different queue. It took me 25 minutes of queuing to reach the kiosks, and another 20 minutes to see an agent. After that, it was onto baggage reclaim, where, due to the delay in immigration, our bags had already arrived and were waiting for us on the floor! I picked up my rucksack and finally left customs at 16:55, just an hour and 10 minutes after we reached the gate. Then all I had to do was get into Chicago itself. You can see how that went after the final gallery. Although I’ve flown to Chicago many times (this is the fifth time since I started the Travel Spot), I very rarely have to get from the airport to the city centre (aka The Loop). Usually I’m staying with friends and so someone picks me up from the airport. However, this time I was going straight into the city. The good news is that it’s relatively easy to get from O’Hare to the city, particularly if you are staying in the centre, with the Blue Line running from its terminus at the airport into the city centre. The Blue Line is one of eight colour-coded lines that form Chicago’s fairly extensive network of public transit lines (run by the CTA) which combine standard surface lines, elevated lines and underground lines (all on the same line in the case of the Blue Line). The trains run around the clock, departing O’Hare every few minutes, with a flat $5 fare regardless of where you are going (it’s $2.50 across the rest of the network). To get from O’Hare to Clark/Lake, on the north side of The Loop, takes about 30 minutes. An alternative is to catch the North Central Service (NCS) on the Metra Commuter train lines which calls at the O’Hare Transfer Station. It’s handy if you’re going to anywhere near Union Station (just to the west of The Loop), but the trains are much less frequent. While there’s a semi-decent service in the morning, there are only two trains after noon, one at four o’clock and the other at six o’clock, although if you’re coming out from Chicago to the airport, the schedule is reversed, with more trains in the afternoon/evening. The first step is to get to the domestic terminals. Terminal 5, where all international flights arrive, is to the east of the main terminal block (which consists of Terminals 1, 2 and 3). These are linked to Terminal 5 by a small, overhead transit which runs back and forth from Terminal 1, via Terminals 2, 3 and 5 before going on to the parking lots north of the terminals. It’s fairly efficient and frequent, taking about five minutes from Terminal 5 to Terminal 1, the longest part of the journey being between Terminals 5 and 3. However, it all goes a bit downhill from there. In theory, as I’ve said, you can get from any of Terminals 1, 2 or 3 to the Blue Line, but there’s nothing clearly indicating that on the overhead transit, so I got off at Terminal 1 where I looked in vain for clear signs showing me the way to the Blue Line station (with hindsight and pouring over Google Maps, I think I would have been best served getting off at Terminal 2 where the walk is shorter, although I doubt the signs are any better). In the end I made my way down from the transit system to the Departures Level, and from there, I found a tiny sign above a lift which directed me down to the Arrivals Level. Here a slightly larger sign above an escalator sent me down to the Parking Level below the airport. However, to find either of these signs, you have to be standing in front the respective lift/escalator: if there were signs elsewhere, I missed them. From the escalator, there’s a series of long moving walkways which take you to the Blue Line station. The final challenge is getting a ticket: when I was there, there were long queues for the ticket machines. Fortunately, as a frequent visitor to Chicago, I have a Ventra card, which is the system’s smart card (it works on the buses and trains too). Since this already had enough credit on it, I just walked through the ticket gates, down onto the platform and onto a waiting train. From there, it was straightforward, riding the train to Clark/Lake, a short walk from my hotel. The only thing to watch is that the Blue Line trains are pretty much like tube trains in that there is nowhere to put your luggage, a rather serious shortcoming on a line serving the airport (although I recall that the Piccadilly line has a similar problem). And that’s it. I was in Chicago. Thanks for staying with me to the end of the journey. Don’t forget to find out what I got up on the rest of the trip and see what I made of my flight back from Chicago. 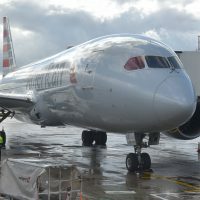 This entry was posted in Brian's Travel Spot, Chicago and tagged AmericanAirlines, Boeing787, BusinessClass, Chicago2018T1 by Brian Williams. Bookmark the permalink.